This is one of my favourite paintings. 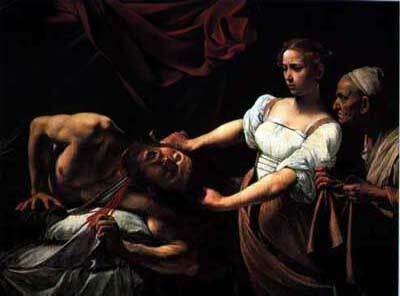 It's a Renaissance oil on canvas by Artemisia Gentileschi. 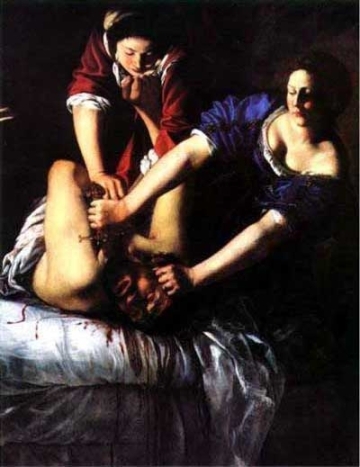 She has depicted a scene from the Old Testament, in which the Israelite leader Judith and her assistant Abra have drugged an enemy warlord, and are engaged in cutting his head off. I love the calm expressions on the women's faces, although I'm told that overzealous restoration has smoothed furrows of concentration and intense effort from their brows. Compare this with a painting on the same subject by Michelangelo Merisi da Caravaggio. A much more sanitised view of a murder.